This page is about the American fighter P-63C-5. For other uses, see P-63 (Family). The P-63C-5 Kingcobra is a Rank III American fighter with a battle rating of 4.0 (AB/RB) and 4.7 (SB). This aircraft is an improved version of the previous Kingcobra carrying the same armament and main gun. The aircraft is still a high altitude interceptor/ Energy fighter, with it's turn radius slightly better than before. The quick dive speed and high energy retention allows the player, with the correct altitude, to engage opponents below numerous times using the high yo-yo method. 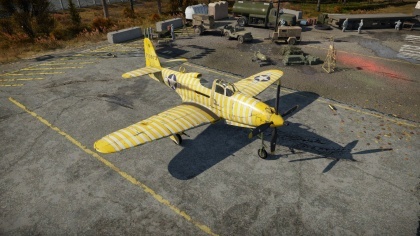 This aircraft should not be used for ground attacking due to it's average ammo count. The 37mm M10 cannon is ridiculously powerful. Aim carefully when firing, and do not fire too quickly, lest your gun jam and you lose your main weapon. A single shot to a wing or fuselage of an enemy plane will be all that it takes to bring it down. The M2 Brownings are similar to the guns on the Bf-109- spotters. Use them to judge the range for your cannon shot. They are almost useless (except for those lucky pilot kills) offensively. Unfortunately, the C-5 is relatively superior to its predecessors. It has far more cannon ammo , and a slightly lower climb rate than the A-10. However, this is relatively trivial as both planes are generally evenly matched. Keep this in mind, though, when selecting your load out of planes. 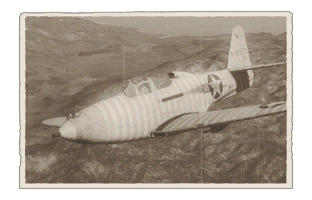 It is recommended to use the P-63 against large fighters and bombers. It is far easier to hit a bomber with the cannon then a small fighter with it. Head-on attacks are not advisable- the large cannon combined with the relatively weak M2s make for poor head on accuracy. Only engage in head-ons if you are absolutely confident in your aim. BnZing is also an effective tactic with this plane. It's large cannon makes getting shots while diving relatively easy, and its high climb rate and energy retention can get it to safety. Bomber hunting is also extremely effective with the P-63- a large bomber is far easier to hit with a massive cannon. A single shot can take off a bomber's wing. However, don't spam the cannon. Keep the delay between shots at a 1-1.5 seconds. Firing too quickly will result in a jam, which makes your plane almost useless offensively. Initially, the aircraft's flat speed is not fast enough to outrun Fw 190 A and F 8s that it may face, so it's recommended to upgrade engine performance first. Armament, although it won't improve greatly, is the next recommendation considering how underwhelming it may be on some occasions- do this by researching ammo belts, then improvements to the cannon. This page was last edited on 6 April 2019, at 18:03.